The network-ready HP Designjet 5500ps (UV) is a large-format printer aimed at design, engineering, and architectural offices and businesses. The Designjet 5500ps UV inkjet printer is capable of delivering high-quality photos with a maximum of 1200 x 600 dpi resolution. It uses HP PhotoREt III and is installed with PostScript to handle complicated print jobs. The HP 5500ps (UV) large format printer has excellent document finishing and comes installed with a 256 MB memory and 40 GB hard drive. This unit does not have expandable memory and is quite pricey. The HP Designjet 5500ps (UV) inkjet printer comes in black and grey enclosures. It has a slot for ink cartridges on its left side and a small control panel on its right side. For connectivity, an internal server is available, plus serial and parallel ports are on the back. 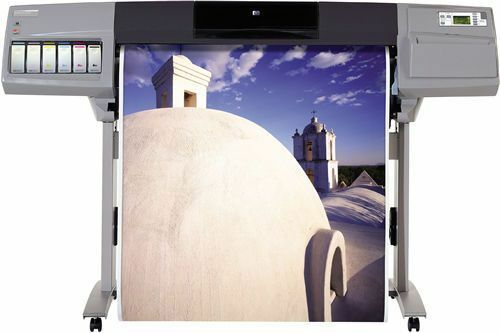 The HP Designjet 5500ps (UV) is capable of printing as large as 42 inches and as long as 300 ft. This UV printer weighs 220 lbs and measures 78 x 27 x 50 inches. The HP 5500ps UV printer is easy to use and share as it has plug and play compliance and comes with HP JetDirect. The HP Designjet 5500ps (UV) delivers great quality prints from monochrome texts to vibrantly coloured images and photos. It has flexible paper handling and ink handling capabilities plus it supports Macintosh, Linux, UNIX, and Windows operating systems. The HP Designjet 5500ps UV ink cartridges come in sets to make the purchase of these supplies more affordable and economical. The HP Designjet 5500ps UV inkjet printer as well as its accessories and consumables are quite expensive, although sets of ink can reduce the cost. Memory cannot be expanded.